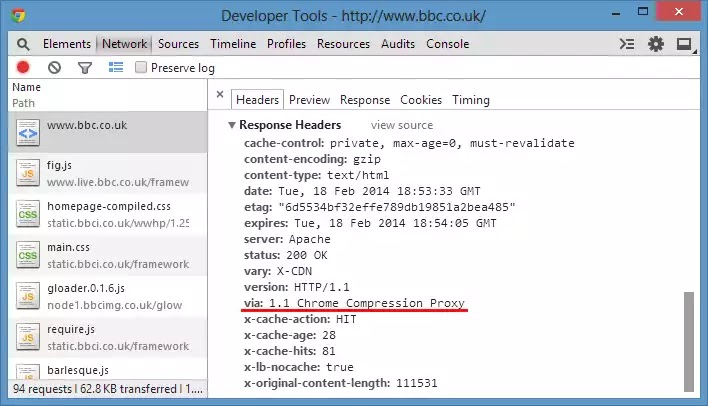 Google has added a Chrome Data Compression Proxy to its mobile Google Chrome browser for iOS and Android. Like Opera Turbo, it speeds up web browsing by greatly reducing size of transferred HTTP packets, by using a SPDY protocol, compressing resources, optimizing images to WEBP format and tunneling all traffic via secure HTTPS connection. Unfortunately, it has been available only to mobile users. Until now. Browsing the net, I have just found an experimental Google Chrome extension, which brings Data Compression Proxy to desktop. This is an unofficial add-on, so it could potentially break some web pages or stop working some day, but for now it works great and accelerates web browsing significantly. What is more, it is open source, so anybody can check its source and contribute to it. UPDATE: Google has released the official Data Saver extension for Chrome.